THE CÔTE D'AZUR SEEMS SOMETIMES to be the vacation destination of choice for Europe’s professional art thief, combining a stress-free vacation while keeping his professional skills in shape. This class of delinquent is the most recent but unlikely to be the last of a long line of nomadic fine-art plunderers. 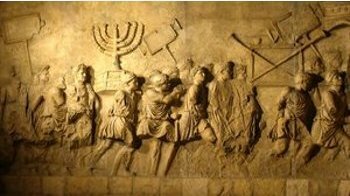 The earliest documented example of art looting is the relief sculpting on the inside walls of the arch of Titus in Rome where the scene depicts Roman soldiers returning with treasures looted from the Temple of Jerusalem in 70 AD. 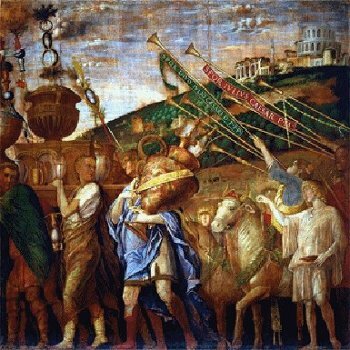 The theme was taken up by the Renaissance master Andrea Mantegna in the period 1486 – 1505 with the superb series of seven large canvases entitled, The Triumph of Caesar that are in the Royal Collection in Hampton Court Palace, London. In the paintings you see Julius Caesar celebrating victory in the Gallic Wars, his army loaded down with booty. Unfortunately, a number of these masterpieces are today in fragile condition. In an attempt to halt their deterioration and eventual loss the author at one time participated in their restoration. The most documented examples of war-time looting in modern history was Napoléon Bonaparte’s sacking of art treasures by the imperial forces during the military campaign in Italy. 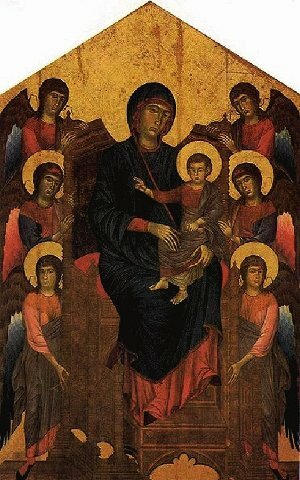 The director of the Napoleon museum, Dominique-Vivant Denon was particularly interested in acquiring paintings of the Italian ‘primitive’ (pre-Raphael) schools and, setting eyes on Cimabue’s 1280 massive timber 2.76 x 4.24 meter masterpiece La Maestà (Madonna and Child), removed it from Pisa’s church of San Francesco to Paris where it is still housed in the Musée du Louvre. During the exhibition, School of Pisa from Cimabue to Giotto held at the Pisa National Museum of San Matteo, in 2005 Cimabue’s La Maestà, was to have pride of place, temporarily back on loan in its original home. At the last moment, the French authorities cautiously decided that, after all, perhaps it was better not to risk loaning the Cimabue. The Louvre, instead, sent in its place a large digital print to make good the absence of Pisa’s iconic masterpiece. The same curious gesture, sending a digitalised print as a replacement for a pillaged work of art, was repeated by the French museum in 2007 on the anniversary of Napoleon's troops looting Veronese’s The Wedding Feast at Cana from the San Giorgio Maggiore Benedictine monastery, Venice. On the sidelines of World War ll was the systematic plundering of conquered Europe’s art treasure by the art-loving couple, Adolf Hitler and his deputy Reichsmarschall Hermann Göring. Hitler’s dream was to make his birthplace, Linz, Austria, the home of a great Old Masters Museum in a united Europe (the Führermuseum). Göring, on the other hand, was a more frenzied collector interested in quantity as well as quality and unhappy only when obliged to relinquish to Adolf Hitler a particularly fine work of art. During World War ll, and despite the slaughter, destruction and misery of war art dealers continued to buy, sell and become rich in the midst of the carnage. As a result of the systematic looting of museums and private collections, particularly those of Georges Wildenstein, David David-Weill and Paul Rosenberg, the art market boomed. In this unsettled period some Dutch and Flemish artists seemingly risked trading with the enemy. Han van Meegeren, sold a Vermeer Old Master “Christ with the Woman taken in Adultery” and Joseph van der Valken a Mary Magdalen by Hans Memling (1430-1494) to Reichsmarschall Göring. Both paintings were fakes painted by the artists themselves and made to appear old by porcelain-like cracking they added to the paintings’ surfaces. Fortunately, for both men their duplicity remained undiscovered. Goring eventually did learn that he had been sold two worthless forgeries rather than the rare and priceless masterpieces he had coveted. He was given the sad news when visited by US museum curator Stewart Leonard 1946. By then, however, the Reichsmarschall was fighting for his life in the Nuremberg trials and appeared more irritated than angry at the news. Adolf Hitler’s innate dislike of modern art caused the wholesale purge of modern art from German public institutions and an exhibition of Degenerate Art in Munich on July 1937. In March 1939 Thousands of Degenerate paintings, drawings and sculptures by Picasso, Otto Dix, George Grosz and Gauguin were consigned by minister of propaganda Joseph Goebbels to the headquarters of the Berlin fire brigade where they were put on a pyre and burned. Reichsmarschall Göring quickly realised the error of destroying degenerate art that had, even so, a serious commercial value. He would later barter the loathed modern art with collectors and dealers to obtain the fine old masterpieces he craved. During the occupation France was denuded of the greater part of its art treasures. The Einsatzstab Reichsleiter Rosenberg (ERR) organisation carefully stored, sorted, catalogued and packed stolen paintings in the Jeu de Paume museum in Paris after which they were sent by train to a storage centre in Munich. Fortunately, a museum staff member, Rose Valland, was present during the shipping and recorded the plundering taking place under the direction of Hermann Göring. She bravely risked her life secretly taking notes of the 20,000 paintings from private and public collections, the destinations of the cases and contents that passed through on their way to Germany. of the Jeu de Paume museum, Paris. 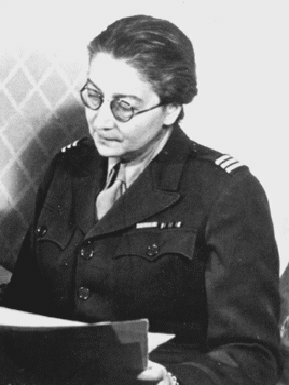 Rose was largely responsible for their recovery at war’s end but, ironically, just barely escaped lynching as a collaborator to become, finally, one of the most decorated women in France. In the 2003 invasion of Iraq by the USA and its partners the National Museum was looted of many of its irreplaceable treasures. The United States apathy to the internationally recognised museum’s wholesale looting left a lasting negative impression on scholars the world over. Some months after the tragic event the US appointed, albeit in a rather perfunctory manner, an American attorney Matthew Bogdanos to try and recover some of the looted treasures and undo the public relations damage. Inevitably, some of the stolen art emerged on the international art market. A New York dealer in 2006 attempted to sell one of the Baghdad museum treasures, a Sumerian stone statue. in 2007, a 4,000-year-old inscribed clay tablet was discovered in Switzerland and, 2008, a number of alabaster and agate objects that could be traced to the pillage of the museum turned up in Philadelphia.